Ever wonder how to make a website with the URL like where you are right now (https://www.madspad.com)? this is called a TLD or Top Level Domain. This differs to a subdomain which looks like this (https://www.lifeviewsandstories.blogspot.com). See the difference? When you are interested to make your own site without a blogspot.com word or wordpress.com in your link, a TLD. 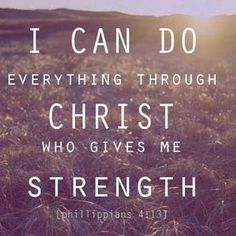 You can make it easier. First thing, you have to look for the best "Domain Registrar" that suits your needs (you may also read the list of domain registrars here). Domain registrar is where you can create your own TLD or your own website under your preferred name. Example: "nameofoyourblog.com"
I would like to share how I made my Subdomain Blogsite to a TLD or own Domain Site. You may read How To Set Up a Top Level Domain in Blogger Deploying a blogger site to my own domain using Namecheap was very efficient for me to use and for the word itself, yes it is very cheap. You can buy a TLD with 10$ (P500) and make your site have richer content. Setting up everything with Namecheap made me excited for effectively have my own website. Could choose my preferred name of the site and do this with easy steps. Google also is giving clear details with regards to verification on how to host the blogspot site via Domain Registrars like Namecheap so I got even more eager to do it myself. In owning your own domain, it is very important to take heed of what to change in the Blog settings of your blog as well as settings on the chosen domain registrar. 1. You will notice that the backend is intuitive and simple. What you paid is worth it so you can manage your website. 2. NameCheap has no misleading advertisements and claims. Unlike other WebHost provider and Domain registrar, in using NameCheap, what you see and avail is what you really get. 3. The TLD of Namecheap only cost at least $10/yr (for the updated price please visit their site) they have a free privacy that cost around $2/ Aside from that, Namecheap offers SSL at very low rates. Aside from that, you could buy your own Comodo SSL starting at just $10 per year. Pretty much right? After purchasing a custom domain from them, it felt a warm welcome received an email making me feel that whenever you have concerns or guide, they are always willing to help. NameCheap standard for me is quite high among others based on experience. Let’s see if the services offered would stay consistent for years to come. Will keep you posted. To start buying a TLD from Namecheap, you may use this link and note that when someones buy using your link, you can get a small commission. Supposedly, you have your blogspot site ready-made from Blogger that is running and with good content as possible as well as with your domain name source is accessible to you. Let's say for example I chose Name cheap as my domain registrar, however, you may also consider GoDaddy, Hostgator, Wordpress and many more sources of TLD. After deciding what to use and domain name. Head over to your blogger profile. Go to Settings->Basic and go straight Publishing section. Hover to 'Blog Address, choose 'Setup a 3rd party URL' for your blogspot blog. Click on + Setup a 3rd party URL for your blog' and there you may add the chosen domain name that you have purchased. Please see screenshot below and take note of the triple w that you have to put to the text box along with your domain name blog address. Tick the checkbox for your blogspot site to be redirected to your new custom domain name site. Your visitor may view your site starting with https for the encrypted connection. You may change the drop-down to yes or no by your preferences on HTTPS section. After filling the important fields upon clicking the save button, you will encounter an error 12 and your own 2 CNAMEs that you'll need to enter later for your chosen domain name registrar. After this step, you can go straight to the address of Domain name source wherein you can set up your DOMAIN credentials, and what you'll input there is the Name, Lable or Host field that blogger provided you in your settings. So now you may see the following steps on how I set up CNAME and A record at chosen Registrar of a custom domain that is at Namecheap. Setting up CNAME Record and 4 A Records. Login your credentials to access your Domain Control Panel. Hover to the Account Tab and choose the submenu 'Dashboard'. Or you may directly choose the ' Domain List' on the sidebar. As you can see, I wrote a blue pen for privacy reasons. Going back to the blogger settings a while ago, you'll see 'View settings instruction' you may view it to get the 4 A records. For the CNAME record, you need to input the 'Host' field from blogger settings to the Host column in your Namecheap settings. Same with the 'Destination, Target, or Points To' field from Blogger that you'll input into the 'Value' column. The image says where to put the important fields. Note that the value of the CNAME record usually ends with googlehosted.com. After this final step, wait for at least 24 hours, observe if there's a problem and your blogger site directs to your new custom domain site. Computer users such as students working in their school assignments and projects, employees in their workstations, or freelancers creating blogs. 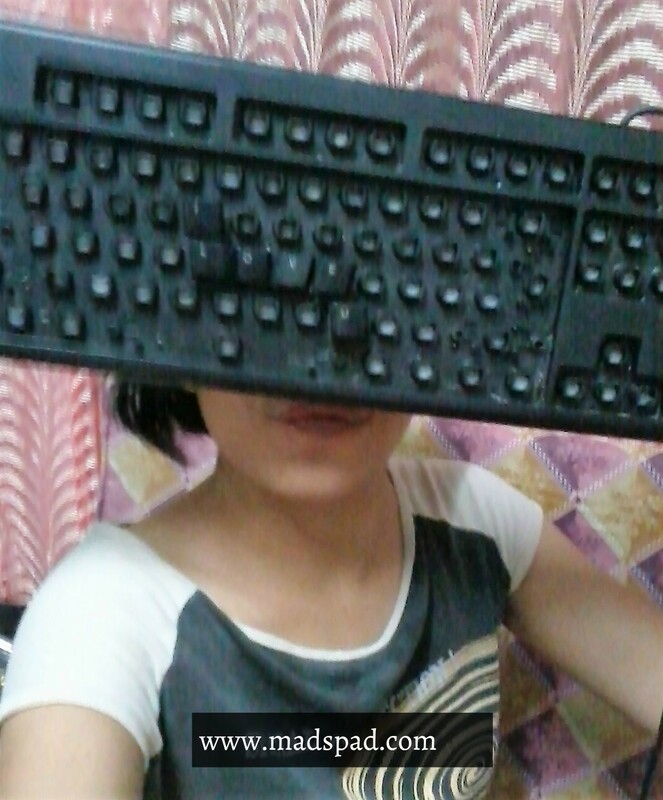 Without the keyboard, we cannot do the task efficiently. Obviously, it is an output part of the computer may it be wired or wireless. We use a computer for typing our necessary work without noticing the dust around, the food and drinks we are consuming on hand with the computer. Drinks like cola, soda, water, juice spilled, even fall out hairs directly to the keyboard. Then suddenly when we take heed of those keys we will observe the dust, crackers, dirt crumbs, and grease, sticky things inside and covering the keys as we examined it really closely. Mix dirt from different things and food all in a keyboard. Wew! Well what important is, It is not too late to realize that our keyboard is full of bacteria that could transfer to our fingers or hands and who knows what we can get from the germs like diseases or allergies. 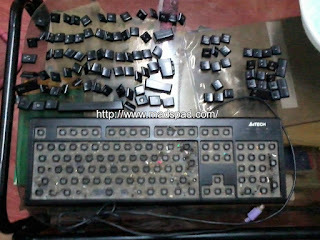 It is inevitable not to get such germs on the keyboard because of extensive use. Possible causes of dirt or tiny things besides the keys during keystrokes are letters or keys not functioning most especially the commonly used letters like keys (BACKSPACE, Letter "e" and SPACE) according to Business Insider. 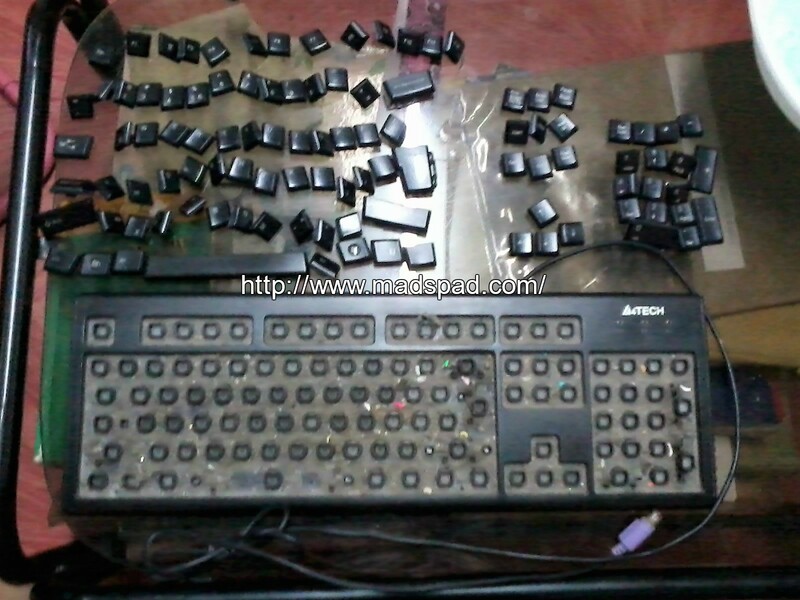 I experienced it before myself cleaning the whole keyboard keys was so effective for me. 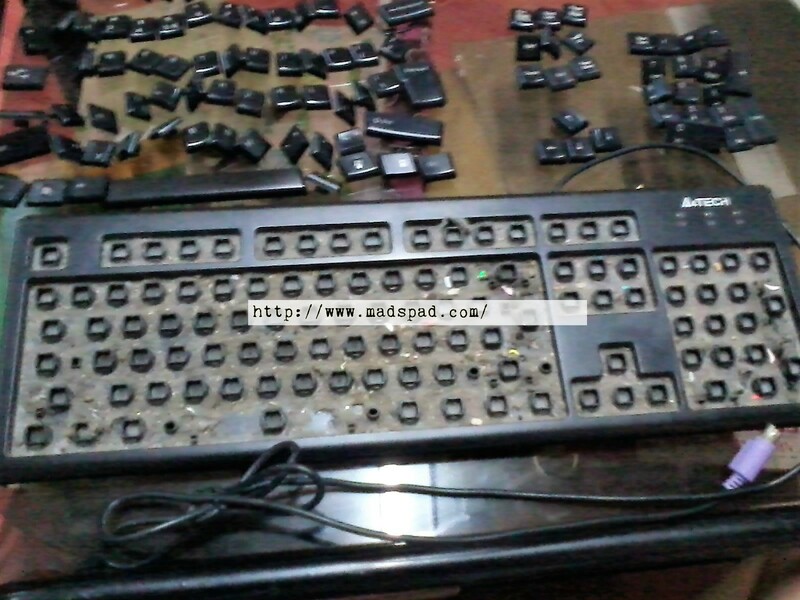 So when you experienced the same, don’t worry because with enough patience and determination to clean your keyboard, you can do it and germs stuck with it will be fully eliminated. The thought that counts could be cleaning it with the following directions. Before you start, you need to make sure that no current is flowing in your computer. To be sure, shut your computer down. Plug in our out the keyboard. (If you are using the wired one) in to the system, plug it out to make sure no current shock is flowing (at least it’s up to you). If you are using the wireless keyboard, you may only shut down your system. For normal dirt in your desktop keyboard, You may choose to clean those without taking off the keys. You can do this by first preparing some cotton buds, at this time a cotton bud is your buddy in cleaning your keyboard. Dip it with isopropyl alcohol, some 70% alcohol is recommendable. Just a gentle cleansing agent to prevent the fading of the letters in the keys. After dipping, Scrub it now with the keys directly to the dirt and the surface that needs to be cleaned such on the sides, face, top, and bottom. You may also use a lint-free cloth or if you don’t have it, the alternative could be the unused lens cloth. If not available, just use a silky and soft tiny cloth that can suit the sides of the keys to be able to clean them. For the laptop keyboard: The mentioned direction is also applicable. Some may use a small toothbrush (You may use an old brush but make sure it is clean and the bristles are capable of taking out the dirt’s of the keys) I’ll be making a video tutorial for laptop keyboard soon. Dub and brush it gently towards the keys and make sure that the cleansing agent can be (gentle alcohol, gentle dishwashing liquid, fabric conditioner) you are using is not spilling under or inside the keys because if you are not careful, the keys may not function once you turn on again the computer suddenly because inside the keys are wet and it may affect the system. The technique here is you can first dub the brush into your chosen cleansing agent. Make sure it is not overly wet by dubbing it again in a cloth or tissue that can sip the excess water before brushing. Then brush it into every side of the keys. The recommended position of brushing is upward so that you can easily swipe to caught the specks of dirt easily. 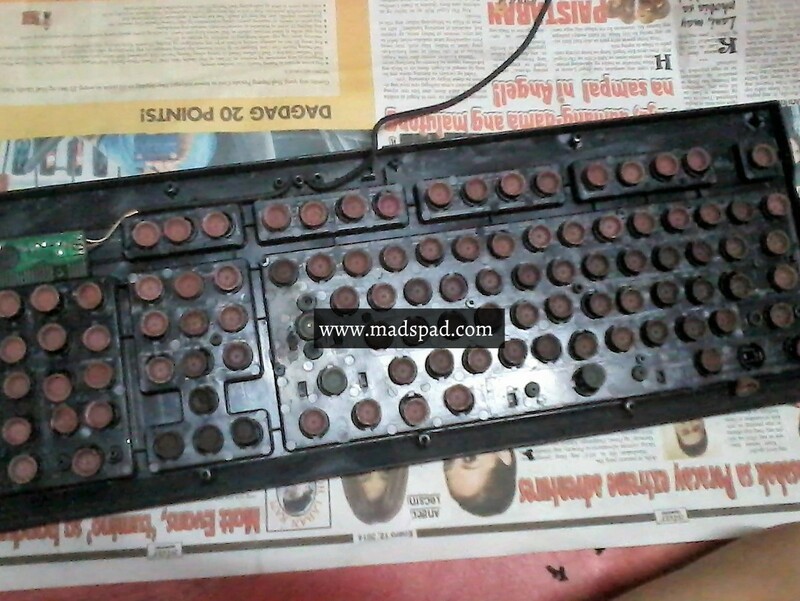 I have experienced to have a very dusty keyboard and I was shocked to see what is inside after removing the keys from it. This is the back of the keys while still in store in the half of the board. I unscrewed the screws first before opening to be able to remove the keys. Typically hairs, dust, dirt, small bits of crackers, are those things I saw on the inner surface of the keyboard. See below image. Most of the desktop keyboard keys can be removed by using a safe tool such as a screwdriver or any turn screw or any bread knife. It is very simple to remove but you need an extra effort as you are not pulling out one key but many keys usually around 70 keys. I suggest also that while you remove the keys out the board, put them into the right place while away or take a picture of the keys to knowing their original position. Prepare a keyboard map. See below image positioning the keys in their right place while away. 1. The first step is to place your chosen tool in the corner of the key and then lift, move it up to remove the keys. 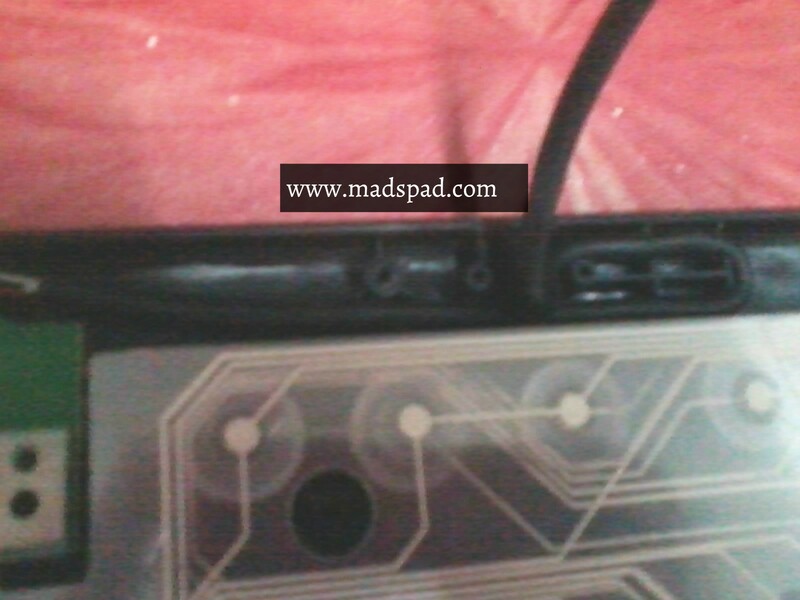 Some desktop keyboard is made as irremovable so you shall observe the areas of your computer if it is removable or not. To be sure, you can search the model of your computer and look if it is removable or better yet contact the manufacturer to prevent your keyboard being damaged. You can also try to shake gently the keyboard to put out the dirt and dust easily. 2. If the keys are already removed and everything is ready to be cleaned, wash to clean each key using the chosen cleansing agent (could be alcohol, liquid soap mix with water, and etc.) 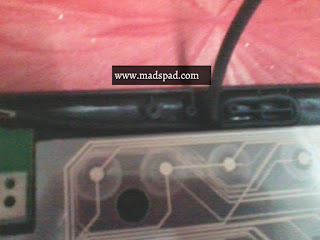 In my keyboard case, I used alcohol with the small amount of water. 3. 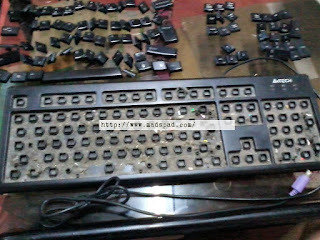 Clean the “Keyboard” or the storage displayed of the keys. “the board or the trench”. Dip a cloth or can use small/disposable towel into the chosen cleansing agent and wipe the keyboard surface. But warning on this, you have to be careful on cleaning the trench as sometimes there is appeared keyboard electric lines(see below image) that can be damaged once it becomes wet and directly used with electricity. 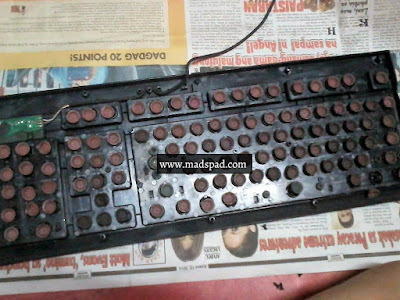 If some part of it accidentally poured or spilled by the small amount of water, you have to make sure the keyboard trench is dried off before using. To do this, you may also use a soft vacuum or compressed air. 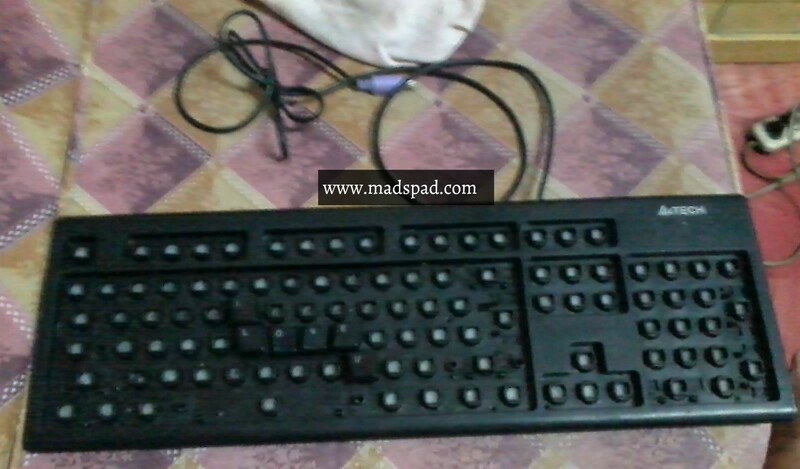 The image below is a cleaned keyboard trench. 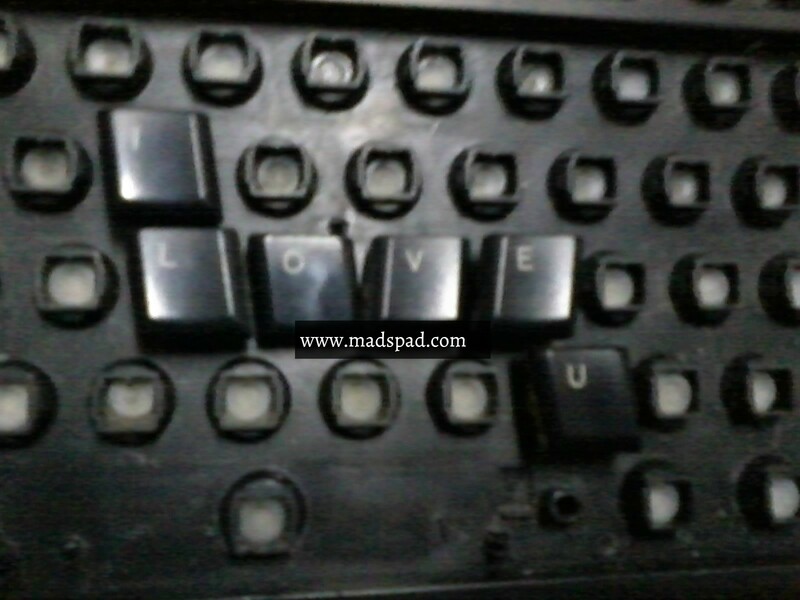 Before I input the keys back again into the keyboard trench, I tried to position different letters formed a word “ I love you” for my readers. On the other hand, wrong positioned of the returned keys may affect the corresponding letter keys. So the keyboard map or It is essential to prepare a guide like what I did which I re-positioned them while out on the keyboard trench. 4. When the keys are now dry, cleaned and ready to be used again, return the keys to the board and put them back into their right place. To feel the accomplishment wipe the cloth into the surface on the returned keys. If the keyboard is wired then plug in it to the system again. Now your keyboard is ready to be hit again for using with a lesson learned. At least don’t bring your snack always at hand while typing. You may also test the key function and Turn on the computer. Welcome back clean and restored keyboard! Disclaimer: I'm not really an expert, this is only base on my experience and resulted in effective and successful. 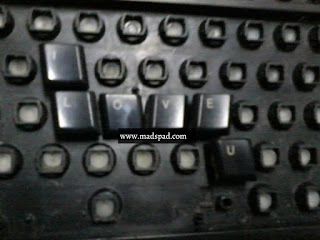 So, clean your keyboard carefully at your own risk. Call center class and training is truly not an easy job. Not easy in a sense that some call center representative handles calls and encountered many conflicts through which is part of every job or irate customers that is inevitable. Some they may call it a stressful job if you cannot really handle the calls along with the customers. When you can put your heart in a job like this, can do the job great and you have a passion for the job while you have fun with it, you can stay longer in the job. Main reason why I applied in a BPO Company in a Call center job, is because of three truthful reasons: My first I.T job did not push thru (story is available below this paragraph), I want to have a work before Christmas and the good reason is I want to challenge myself if I can do the job. There is no real wrong in trying, right? I was also curious to know if I can handle calls along with giving of service through my communication skills. Before I applied in a customer service.position, I became frustrated with my previous application to high paying I.T company that did not push through for the reason that is too far away from my house. Unfortunately, during those times I was not able to live on my own or rent on a dorm near the area I was supposed to work. I did not expect that I was going to be assigned in that branch so i refused to continue my contract and happily they did understand. So that was the third strange reason. The most thing that helped me pursue my call center application is my determination towards enhancing my 'communication skills'. This call center experience is my first job that I have accepted but not the first job I applied. You can read about how I handled the job application process in a Call Center together with ‘Call center related interview questions with Good Answers’ also available. So being in a Call Center field was definitely my choice and I did not regret it. We handled a very big private company's account. This first-ever experience was where I learned to use lots of call in mobile phones as sample training such as conference call. A conference call is a kind of mobile call which is made for talking to involve people at the same time using your phone so everyone involved can either speak or listen only to the voice call or can be both. I've also learned Call Forwarding, Sup Call which means Supervisor Call transfer if the customer requested to talk about the problem and most important is how to build rapport with the customers. Imperishable is the learning about our own client's mission and vision statements, likewise their Core Values. The most fun and memorable experience I had during my stay is the free lunch every day. Practically, we can save more money instead of buying meals during lunch so it was fun for me, I was so grateful. Conversation skills and team playing enhancement via providing games like "I want to be a ‘tutubi(grasshopper)’’, ‘hephep hooray’ (game first learned in Wowowee show), tongue twisters game. Those games unleashed my childlike side and made everyone fun and excited to work more! Entirely, the experience of training was great and I have learned a lot from my Project Managers, Team Leads, Assistant Leaders and other Members and met a lot of different kinds of people in the industry. First days of training, I was like really shy, silent, killjoy, boring surrounding with strangers but with the help of lessons on enhancing communication skills and training regarding building relationships with people particularly of course with customers. I was transformed and changed in a good way and felt that my communication skills became enhanced that every day with my colleagues, we are not competing but we built a friendship. We built a happy relationship. I was determined to pass every exam we had until it ended when I found a more suitable job for me. I had to say "See you again" yet "No "Goodbyes". :) My Call Center experience is indeed unforgettable. I've been with a Call center account management training for only a few months. Yet still recommend aspiring applicants grab opportunities you may get most especially if with wonderful perks, shall mention not to regret in the end. But instead, be thankful for all the learnings and eureka's. Never afraid try other things that may challenge you, be fearless and spontaneous sometimes. These common interview questions along with the possible answers are not mine being induced but are only a guide on what to answer on call center interview. Still, natural or the original answers essentially being yourself are one of the things worth to practice on a stipulated time before your interview day. Good luck and hope you pass to get the job offer. My natural answers during interview helped me a lot to be who I am today. My communication skills improved unlike as a fresh graduate before I did not know how to be vocal and communicate with other people. So I hope my tips would be helpful to the job applicants who are reading this post for Call Center jobs, or any call center position may it be technical sales, or quality assurance. I also have helpful videos that focus on 'Sales Interview Questions with Good answers that is usually for a job target positions like inbound customer call center agent, sales representative and many more sales call center related jobs for freshers or experienced applicants. You can watch it here or click the hyperlinked name. Most of us care for our pictures to be organized or properly arranged in our Google Plus Account especially people who are Google active user. But did you know that you can organize your photos on your Google Plus Account? The answer is YES! If you want more privacy, Do you want to set your Google Plus public pictures in 'private' only? Now if your answer is a NO NO, I will tell you how I made my Public Photo to private. Thinking maybe our photo privacy changes depends on us like on Facebook, I tried observing my unnecessary photos that still stock my Photos, saved, including images I used on my blogs. These photos are all public big time and with that, blog photos should normally be public, Furthermore, If you make it Private, when others view your blog, images you made private will not appear. So never try making your photos associated with your Blog private. When you check your public profile photo, it is public, right? Even my current profile picture right now is public at first, but now it's private! Take a look at mine here. Now it's private, if you have Albums that is not connected to your blog, you can also make it private. To make it more understandable. I included images which tell you the step by step on how to make your profile photo to private. 1st, Click the Photos on Your Google Plus Profile. 2nd, Click More to View All "Albums"
5th, Make a new folder(as cited in my example I made an album entitled it "private pics" ) then choose Move. 6th, Now you see that your profile pics are now private, not shared and unviewable. Note: Never make your photo albums that connected to your blog, private; because if others see your blog, the pictures in your blog will also be unviewable. You can also do that in your Cover Photo or any of your other albums. An multi purpose open book about own life perception, experiences, learning and everyday life tips. Shared knowledge about technology, own reviews, about career and money and trending news. This blog is like Writing in my own Pad with a heart.